McMaster University’s Master of Communications Management (MCM) is Canada’s only professional communication management degree combining core MBA courses with cutting edge communication theory. 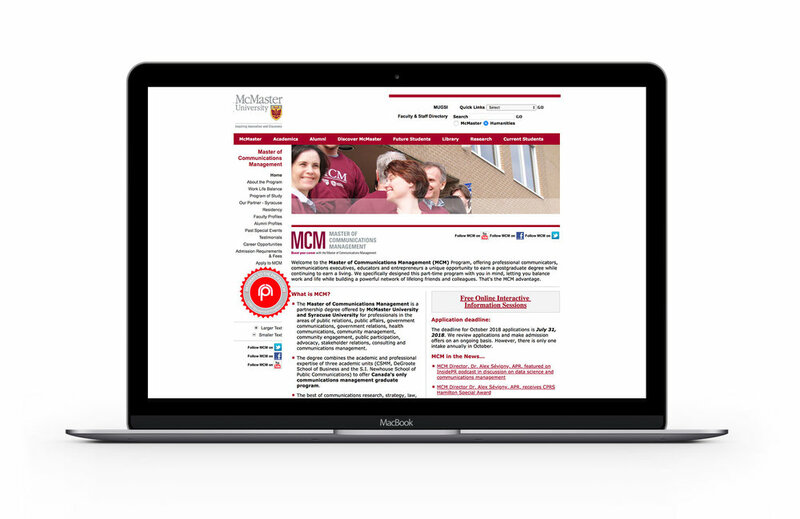 McMaster University approached us to develop and manage an ongoing marketing and branding strategy for their MCM program. To lay the foundation for our strategy we needed to understand the state of the Canadian public relations industry and attitudes towards graduate-level credentials. As there was a paucity of market research data available, we began interviewing over 20 senior-level practitioners, analysing over 800 job postings, and crafting a bilingual survey completed by over 200 CPRS and IABC members. This research was invaluable in informing our holistic marketing strategy allowing us to identify and reach the most receptive audiences and industries in Canada and abroad. Now in its 11th year, the McMaster-Syracuse MCM program is one of the leading communications management programs in North America. We aim to make it the highest ranked program in the world.